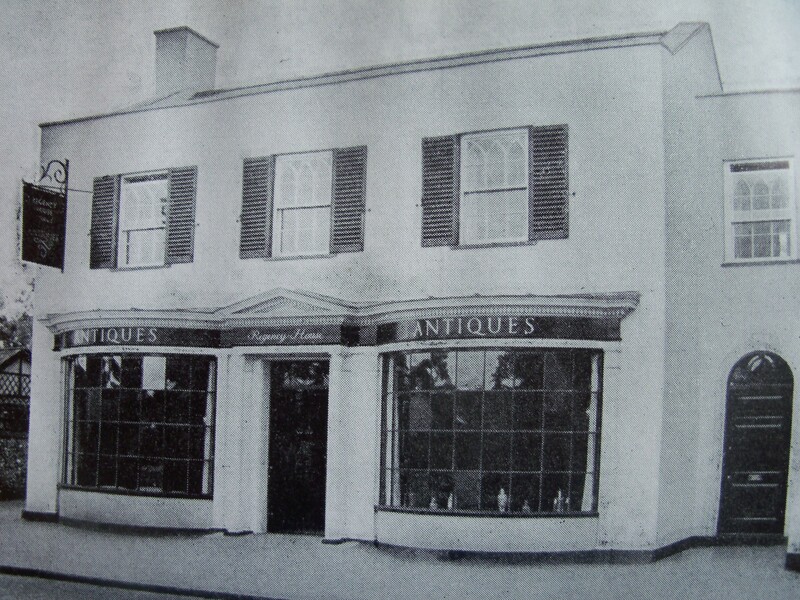 Mallett & Son Antiques – dealer ephemera from the 1890s and 1990s. 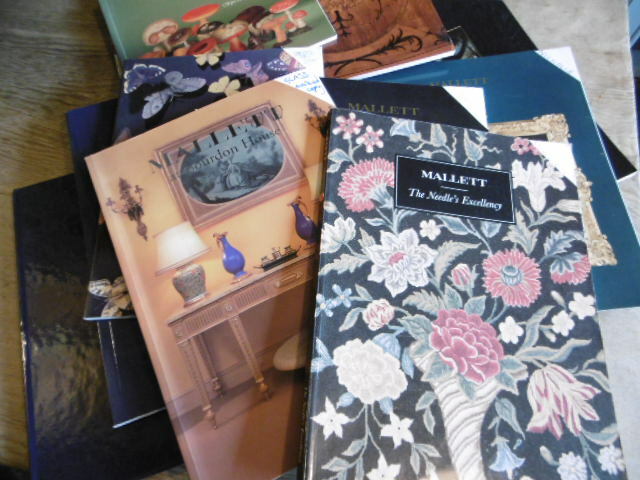 A collection of Mallett Antiques sales catalogues, 1990s. 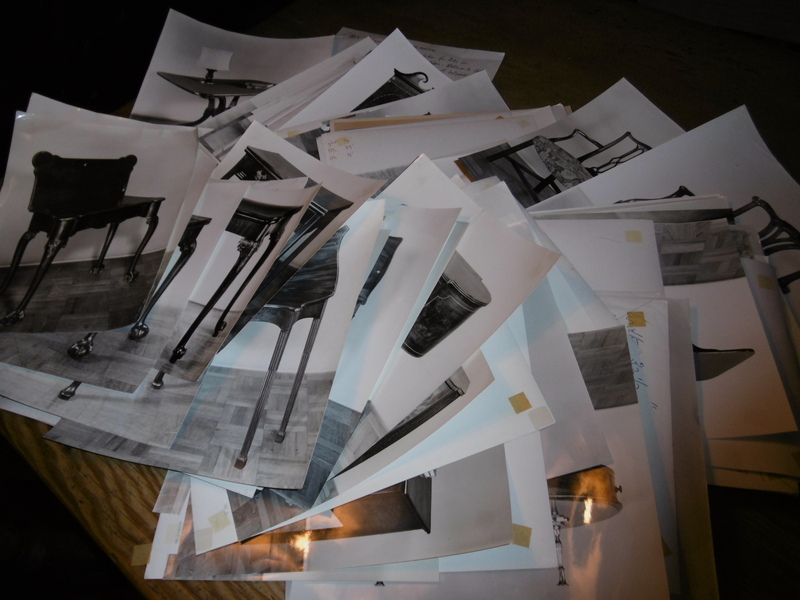 Materials related to the antique trade continue to be donated to the project – thank you again dealers! John Smith, a very good friend to the project, posted us a stack of old dealership catalogues – from the leading London antique dealers Mallett & Sons, and dating from the 1990s. The catalogues are, of course, relatively common, and can be picked up at second-hand book shops (and indeed charity shops) anywhere in the country – BUT, what makes the catalogues that John has kindly posted to us unique is that these are marked and annotated staff copies, with prices marked (and whether the objects were sold) of the objects illustrated. These are a fantastic resource on pricing structures (in the 1990s) for a leading dealership – there are also cost prices and suggested sale prices in some of the catalogues (I’m not revealing those here of course….the analysis of that is part of the research into the history of the discrete (and discreet!) practices of the antique trade itself). 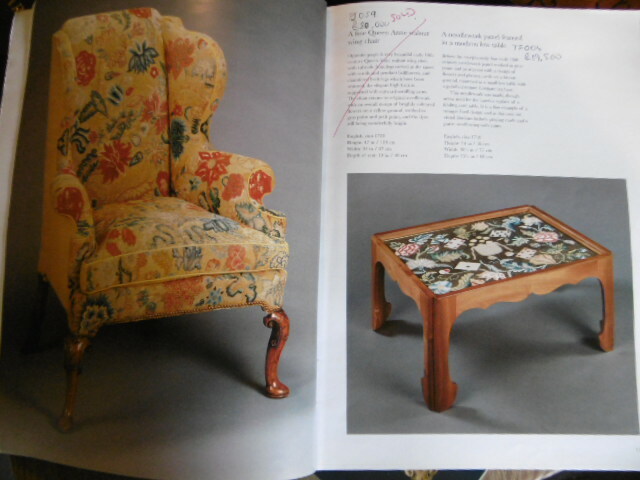 The pages in the catalogues are fascinating though – here’s a page from one of the catalogues (dated 1997), and labelled in pen, in the top right-hand corner on the cover as ‘Nicholle’s’) – which illustrates as ‘Queen Anne walnut wing chair, c.1710’, and priced at £80,000 – marked in red ‘SOLD’; and a ‘needlework panel, c.1710, framed in a modern low table’, priced at £19,500. 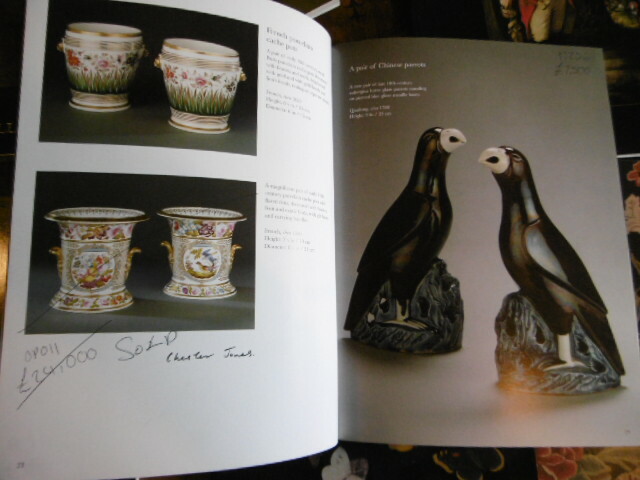 And, another (above) – left page – ‘French, early 19th century cache pots, 1800/1820’, priced at £15,000 (top) and £24,000 (bottom) – the bottom pair are marked ‘SOLD’; and (right page) a ‘pair of 18th century Chinese parrots’ at £7,500. Changing fashions in antiques, even in so short a time ago as the 1990s, may have made some of these prices look quite ambitious, and some look like bargains…..
Mallett of course are still trading (see Mallett Antiques) – they were established in 1865, in the West Country (in Bath, Avon….Mallett’s are now, as many readers will know, owned by Stanley Gibbons Group, and celebrate 150 years this year!…I hope there’s a party?) – anyway, I thought it would be interesting to show some early ephemera associated with Mallett. 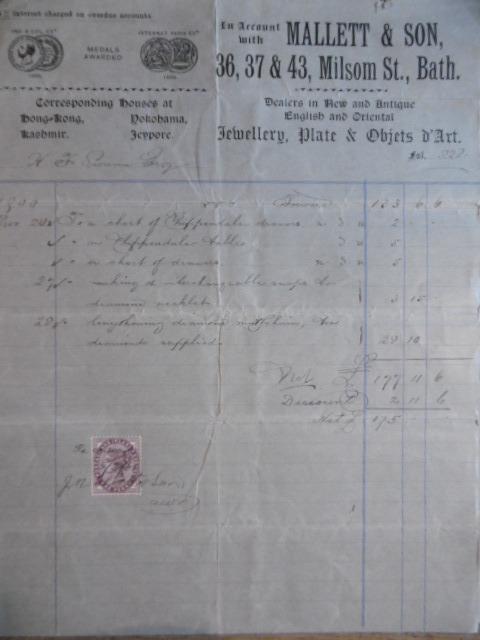 Here’s an invoice (below) from ‘Mallett & Son’, dated 1900, to ‘H.F. Swann Esq.’ The invoice describes, amongst other things, a ‘Chest of Chippendale drawers’, sold for ‘£2’, together with ‘a Chippendale table’, (£5). Mallett were at this date trading from 36, 37 & 43 Milsom Street, Bath, and described themselves as ‘Dealers in New and Antique English and Oriental Jewellery, Plate & Objets d’Art’. Invoice from Mallett & Son, dated 1900. Copyright Private collection. 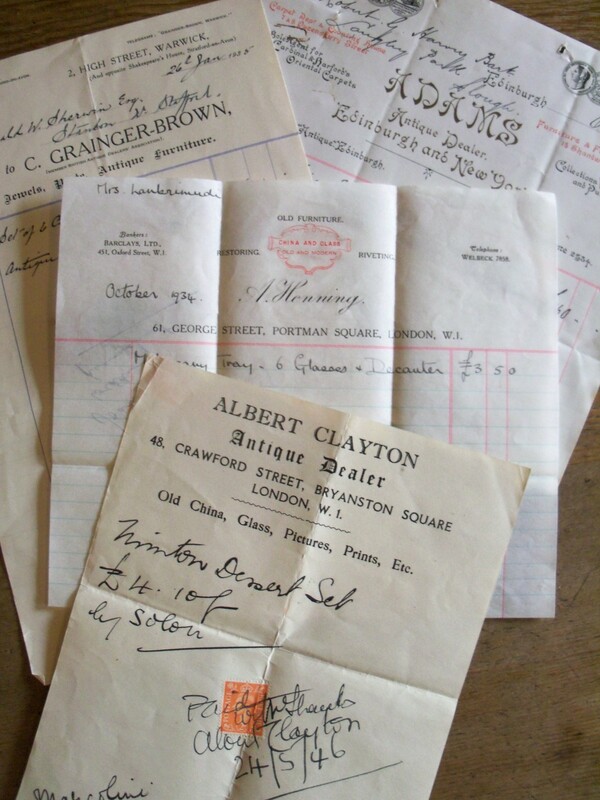 Invoices from Mallett & Son, c.1899-1920. Copyright Private collection. 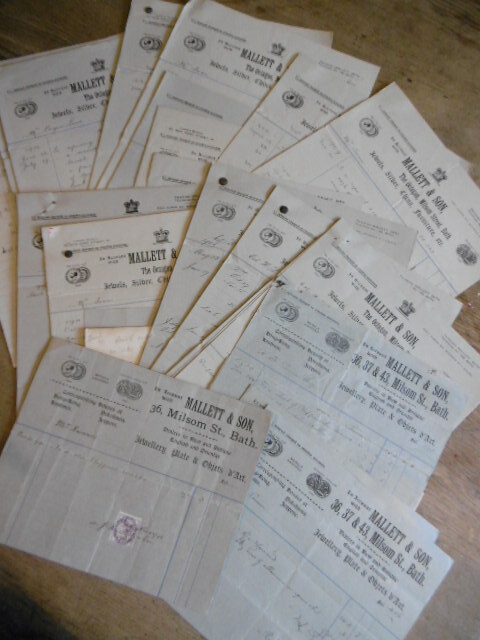 The invoice is one a small cache of invoices (see above) from Mallett dating from c.1899 to c.1920 that are currently part of a private collection – but will be donated to the antique dealer project in due course. This small collection also gives a fascinating insight into the early history of one of the world’s most important ‘Antique Dealers’.